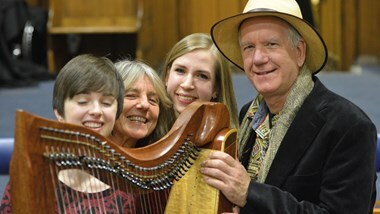 A weekend workshop for folk instrumentalists and singers. Whatever acoustic instrument you play (fiddle, fretted instruments, whistles/flute, squeeze boxes, etc) you're welcome. You might also like to lead a song. The two tutors are both singers and multi-instrumentalists who can offer some one-to-one guidance if time permits. We'll have simple parts for anything you bring and most of the music will be available in advance. We'll work through about 10 tunes and songs with arrangements, occasionally splitting into smaller groups, then come back together for the whole "orchestra". You don't need to read music, but no absolute beginners, please. On the Friday and Saturday evenings there will be an informal session where you're welcome to perform your own songs/tunes.